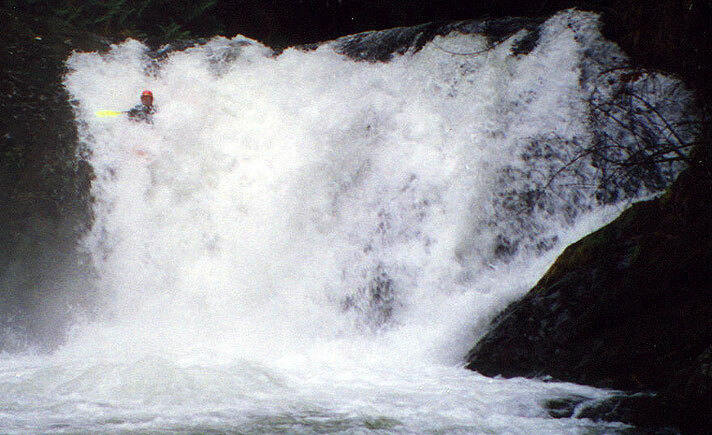 This section was first run in 1987 by Lance Stein and others, but to this day it is not paddled very often. 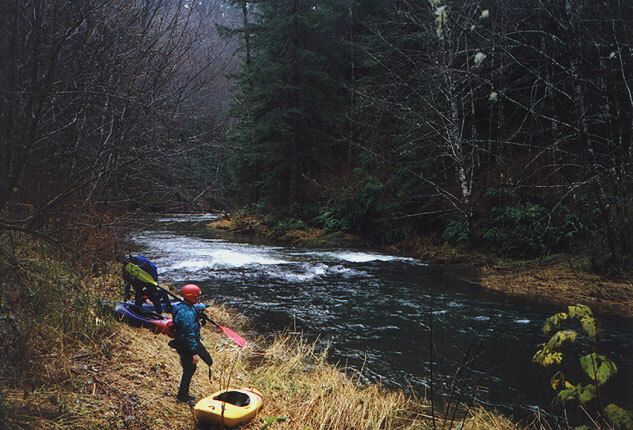 We were first drawn to the Upper North Fork when we read a trip report on the river written by Dan Coyle. The NF drains part of the coast range west of Corvallis and we knew from Dan's report that there was a big waterfall and a difficult ledge drop up there somewhere, but other than that the description consisted of his notes and was a bit vague. On this trip we had quite a large group- Pete, Mike, Tim, Tom, and Dave Mcneil. We had a little trouble finding the put in because the directions we had led to a gated road. Undeterred, Mike burrowed into his map and found a 'long cut' around the gate. It ended up taking us an hour to navigate up through a maze of logging roads, but the run was well worth it! When we finally got to the put in bridge there were a couple of hunters there and they immediately came over to us when we started unloading the boats. "You guys better be careful," one of them said. "There's a big waterfall just downstream.." Dave grinned. "Oh yeah" he replied- "We're gonna run it!" The hunters gaped at us in disbelief then scrambled back to their rig and dug out the camcorder while we warmed up. The put in on the Upper North Fork. When we got to the falls about a quarter mile downstream from the put in bridge the local boys were there waiting with the camera. We scouted the falls and it looked big but doable. Dave went first and sailed off of it on the right, disappearing briefly into the foam at the bottom in his Vertigo. He popped up and whooped. After that the rush was on! Tom, Pete, Mike, and Tim blasted over it in rapid succession while I shot photos. I went last and managed to boof a small rock outcropping on the right wall about halfway down which brought my bow up and I barely got my helmet wet! Below Vanorten Falls the river is really mellow for about two miles, but we had so much adrenaline pumping in our veins we hardly noticed. The NF has a thick, rainforesty feel, and it is a very pleasant ride even when it flattens out a bit. 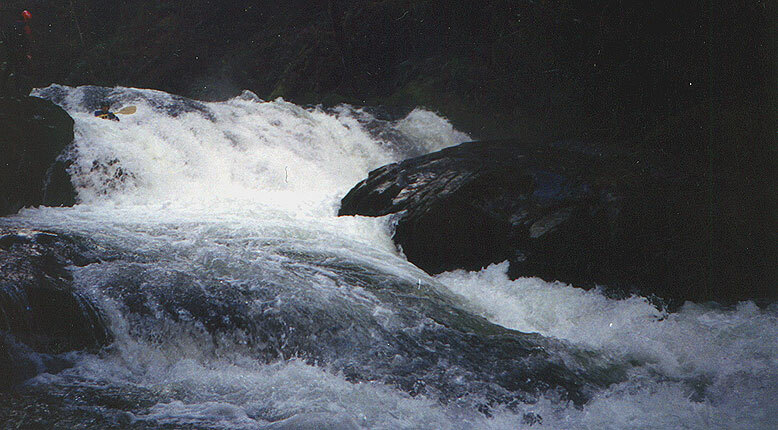 After the flat section the bottom drops out and there are seven or eight very closely spaced rapids in the III to III+ range. All of these rapids can be boat scouted but we were very careful in this section because we knew there was a big ledge somewhere downstream. Eventually we arrived at another big horizon line with steam rising up out of it and we got out to scout. We found ourselves confronted with a tough looking broken double ledge drop. The left side plunged into a hole that was backed up by a rock ledge ten feet downstream. This rock wall made the only sane route down the right side. The right side had a thin move off a big twisting pillow of water down between two large holes. Just downstream was a log in the river, so we posted three people with throw ropes at various points in case something went wrong. Dave was the only one who was optimistic about this drop so he went first again and sailed over it effortlessly. There was a big pause, and then I said "I'll go next..." We rearranged the safeties and I studied the line and before I knew it I was in my boat ripping down into the maw of this thing... I was a little too far left and plunged into the groove and went in very, very deep- I was under water for a couple of seconds and then I popped up on the other side of the pool next to the bedrock ledge, gasping and sputtering in surprise! (The water is so highly aerated here that if you miss your line you are going deep!) Mike went next and did the same thing I did- he ran right down the fold and plunged deep into the pool, popping up next the ledge on the far side. "Was I under that long?!?" I asked Tim after Mike popped up. "Yep!" He said, grinning. 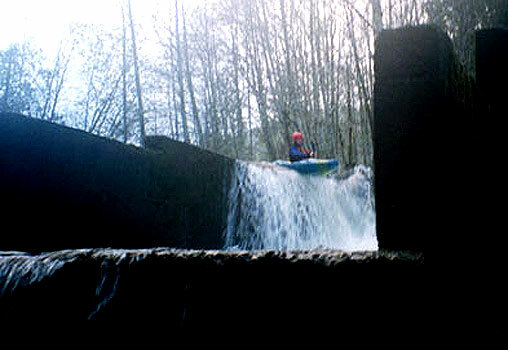 Tim's line was similar, except he came up and kind of splatted the ledge downstream before getting blown past it. Tom and Pete had perfect lines and sailed over the churning mess without a problem. Tim's run over the ledge. Below here the river mellows out a bit until a 15 foot double fish ladder that Dave, Tom, and Pete ran but the rest of us didn't. This drop is tricky because the first part drops into a narrow, fast chute of water that exits through a four foot wide open gate- an upside down boater could easily get wedged in the bottom slot. Also, the only runnable side is on the left and it is on private property. The landowner was not pleased to have three kayakers on his land scouting, so it is probably best to portage quietly on the right or scout from the right bank. Below the dam is a couple of miles of class II and then we arrived at the take out. It took us an hour to find the shuttle cars when we drove back up in the dark, but we did eventually and headed for home. One last thing- somewhere below Vanorten Falls is an excellent rodeo hole on the outside of a gradual right hand corner - Don't miss it! Vanorten Falls has a nearly invisible four foot wide, ten foot deep pothole about eight feet off of the river right bank just over the lip of the falls. Eventually I hooked up with the hunters to get their video footage, and he showed me some other videos of them up there in the summer. They were sitting in the pothole (it looked very much like a natural hot tub) at the lip of the falls, enjoying the view! You can spot this feature when you scout the falls- it looks like a wave hole just over the lip on the right hand side. Avoiding it is not difficult as the lead in is class II, but hitting it would likely result in a very painful tumble down the face of the falls! The pothole isn't a true cave and is only about ten feet deep, so it forms a pool at the lip of the falls in the summer. Portaging the waterfall is very easy, but if you portage it you will probably also portage the ledge downstream, which is tougher and more dangerous in my opinion. First of all, don't even think about trying to find the put in without a recent edition of the Oregon Gazetteer or a forest service map, because you won't be able to do it! The Gazetteer is better than a FS map because it has the names of the roads. Dans original instructions (as described on the WKCC site) no longer apply because Yew Creek road is now gated. First, look at the Gazetteer and count the bridges that cross the NF Alsea above the highway 34 bridge. The put in is the fourth (not counting the HWY 34 bridge) bridge that crosses the NF counting upstream from the Hwy 34. (the put in bridge is about a half mile above the confluence with Parker Creek). There are a couple of ways to get to this bridge, but this is the one we used. From Corvallis, drive west on highway 34 until you cross the North Fork- this is the take out. Keep going through the micro-town of Alsea and in about ten miles look for Fall Creek road on the right. Turn and drive up Fall Creek road and stay on it for as long as you can. Once the road begins to fork just follow the map but the key is that once you get to Racks Creek be sure you don't mistake it for the North Fork. There is a large quarry next to Racks creek and a large double falls just upstream from the quarry (Dan has run this creek, including the falls). The double falls is visible from the road. Once you get to the quarry you are very close! Keep driving downstream paralleling Racks Creek until you cross the NF Alsea, turn right, and start looking for the put in bridge on a side road- it should only be about a mile or so from the quarry. It is easy to figure out if you are there as Vanorten falls is about .2 miles downstream from the bridge, but it is not visible from the road. Also, the first picture on this report was taken from under the put in bridge, if that helps at all. Remember, even if you know where you are going the shuttle will take 45-60 minutes one way! 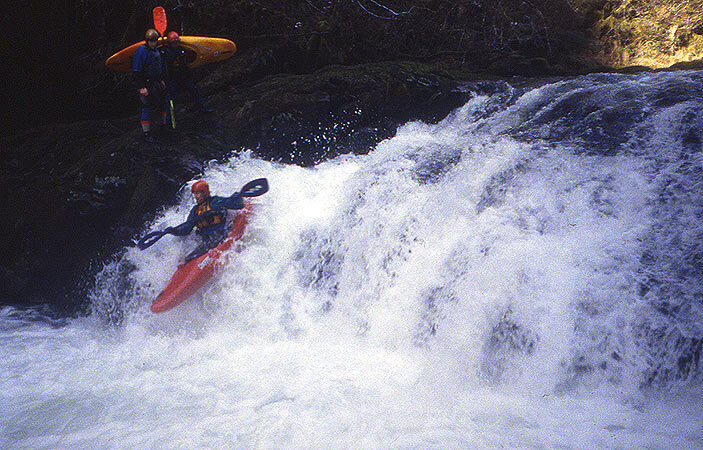 We ran it in December 11th, 1999 at 750 cfs on Pat Welches internet gauge. This was a fine flow but the difficulty wouldn't change much with a bunch more water because the riverbed is so wide.